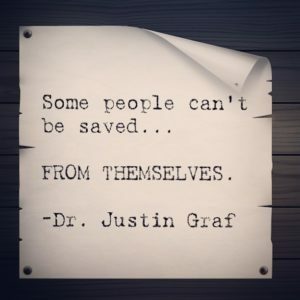 Some people can’t be saved…FROM THEMSELVES. Sometimes people are their own worst enemies. Their habits and behaviors can be destructive to their health. Unless a person is ready to make a change, they will continue to suffer with their problem. Unless they can eliminate old ways of thinking, they will continue to suffer. Some people are addicted to their problem, their diagnoses, their pain. It has become their identity. It has become so ingrained, so intertwined with the essence of who they are. Making a change. Fixing their problem means giving up a piece, a big piece of who they are. Makes sense, but not really…right? Think about a smoker. They know logically and rationally it’s a destructive behavior. Yet they identify with it as part of them, so that cling to it because they falsely think it is who they are. Same could be said for someone who is overweight or obese. Changing may mean they lose their identity. Same could be said for someone with chronic pain or illness. They let the diagnosis own them. Some people are addicted to their problems and don’t want a solution. They are not ready for it yet. Don’t fall into the trap of wasting your energy and time trying to help these people. They have to want to change. Otherwise, your efforts are wasted and they will drag you down with them. Do not let yourself get caught up in this pattern. If someone can identify themselves with a negative health problem, can they not just as easily identify themselves with a positive one? Think about the so called “health nut”. It’s the same thing. This person identifies themselves with healthy behaviors. If we identify ourselves with our thoughts and actions, why not positive ones? It takes the same amount of energy. Choose your thoughts and actions wisely.